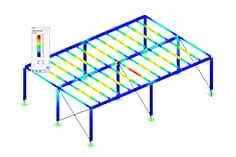 We modeled and calculated a steel hall in RSTAB. In parallel, we want to calculate the corresponding base plate in RFEM. Can we transfer the "foundation loads" (bearing loads of the hall supports) into this RFEM model and recombine them for the base plate? If you do not open the hall in RSTAB but in RFEM (create a copy of the model and change the file extension from * .rs8 to * .rf5), then you can take over storage forces after calculating and saving. 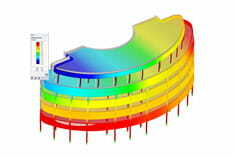 To do this, open the "Extras" in the model of the base plate and select "Take over bearing reaction from load". After that, the bearing reaction can or must be taken over individually for each load case. The combination of the load combinations is then carried out via RFEM as usual.